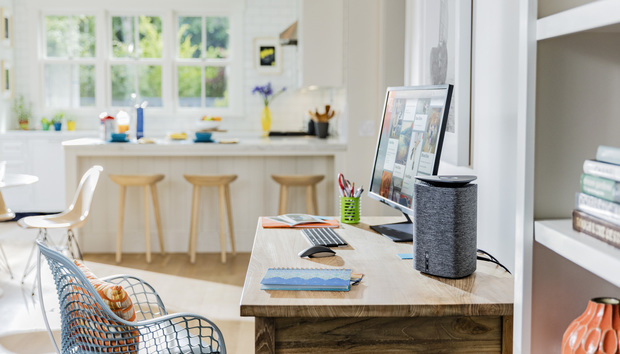 HP’s Pavilion Wave is showing me the PC of the future, and it looks a lot like...a stereo speaker. Or maybe a very high-tech flower vase. Power users, hug your hulking full-tower close, because the PC world is a-changing. That’s actually the point. Announced Thursday at IFA in Berlin and due to ship September 16 for $530 and up, the Pavilion Wave doesn’t want to skulk under your desk like a traditional tower PC would, boxy and ugly and alone. It wants to be out with its peeps, involved in everyday activities, maybe even running your music tracks or streaming the Saturday night movie choice. Despite its small size, the Pavilion Wave is designed to handle all that, plus your mainstream productivity applications, and even some gaming. HP hopes the Pavilion Wave will catch the eye of consumers who’ve fled conventional computers by offering them lots of power in a pretty, friendly package. The package is noticeably smaller than the typical PC, because apparently we’re living in less space. According to HP, the size of the average American home is 40 square feet smaller. This statistic doesn’t jibe with the alarming McMansion trend in my suburban neighborhood, but a quick check of U.S. Census and EPA data confirms that nationwide there’s actually a steep rise in the construction of multifamily housing, much of it one-bedroom rental apartments. The Pavilion Wave is a computer and a speaker and a tasteful tabletop object. That’s where the Pavilion Wave fits in. Look at it: It’s basically a mini-mini-mini-tower (about 6.81 x 6.62 x 9.25 inches), sculpted in a softly triangular shape with a tasteful, tweedy fabric cover. There’s barely a front or a back, unless you count the column of ports along one apex as the de facto rear view. The Pavilion Wave does closely resemble a speaker, and that’s not entirely coincidental. A mono audio unit is nestled in the center, while the PC’s components surround it. The top of the Pavilion Wave consists of grillework crowned by a swoopy upside-down cone. This cone—officially called a parabolic reflector—has a special metal coating to help it conduct the sound 360 degrees outward into the room, and at broad frequencies. Then there’s the sound coming in, whether you’re chatting via Skype or issuing voice commands to Cortana. Dual noise-cancelling microphones built into the Pavilion Wave are designed to grab your voice even if you’re sitting on the sofa while the PC’s on a desk or shelf in another part of the room. Now let’s look inside. Note that you can’t officially open the Pavilion Wave—you choose your configuration (if buying through HP.com) or buy a pre-built SKU and that’s all you get, with no future upgrading available. Sorry, builders. In any case, the video above shows you how HP packed the PC components around the central speaker. It was no small feat to fit everything in there and cool the Pavilion Wave adequately. One side of the unit houses the motherboard, CPU, GPU, and SSD. The hard drive occupies the second side. Thermals and heat pipes takes up the third side, conducting air across cooling fins on the top. Depending on the model, the configuration options include Intel 6th-generation (Skylake) quad-core CPUs, ranging from core i3 all the way up to core i7. You can load 4GB to 16GB of DDR4 memory. Storage options include traditional hard drives up to 2TB and hybrids with, for instance, a 1TB HDD and 128GB SSD. The Pavilion Wave can drive two screensup to 4K resolution. Small form factors usually mean disappointing graphics, but all is not lost with the Pavilion Wave. Out of the box it supports up to two 4K displays. Intel’s HD 530 is the standard, integrated solution for most models, but you can upgrade to AMD’s R9 M470 discrete GPU. No, it’s not a desktop part, but it offers enough oomph for editing photos and videos, or “1080p gaming at reasonable frame rates,” according to HP executive Mike Nash at a press briefing. As you might have noticed in prior images, this PC has a good array of ports: DisplayPort and HDMI, Gigabit LAN, an SD card reader, and a combo audio jack. You also get three USB 3.0 Type A ports. The sole USB 3.1 Type-C port is Gen 1, meaning its data transfer rate is 5Gbps—nothing to sneeze at, but this is yet another PC that’s forgoing Gen 2, 10Mbps speed because of cost. HP’s Pavilion Wave may never earn the respect of power users because it doesn’t offer the upgradability and expandability that have long defined the platform. But this PC isn’t made for power users. It’s made for the many mainstream users who wouldn’t open their PC even if they could. More importantly, it’s an attempt to step away from the image of mainstream consumer PCs as commodities. It’s trying to make PCs special again. It’s too early to tell whether the Pavilion Wave will catch on, but at least it’s not another boring box, of which I’ve seen plenty.